The Mayday deluxe 4 person emergency backpack kit is designed to provide survival supplies for four people in case of an emergency or disaster. 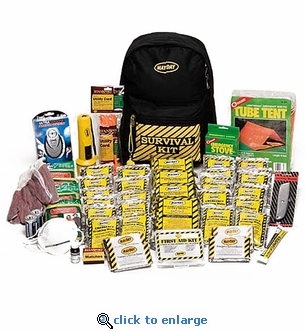 Backpack emergency kits are great for home, office or your car and can be grabbed quickly if you have to evacuate or find shelter away from home. Our deluxe emergency kits have the supplies you'll need for shelter, warmth, emergency food and water.